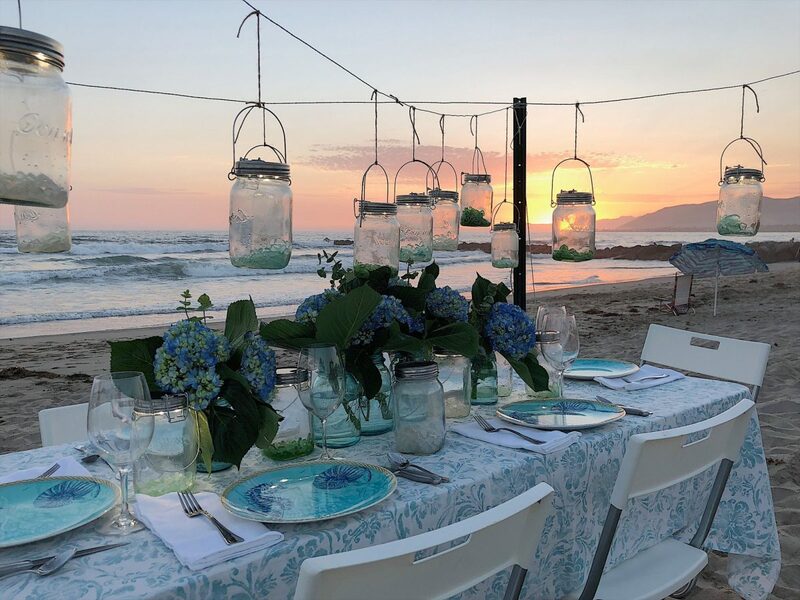 Ever since we bought the beach house in Ventura I have wanted to host a dinner on the beach. As in “toes in the sand, practically in the water” dinner on the beach. This past weekend my dream came true and it was truly magical. 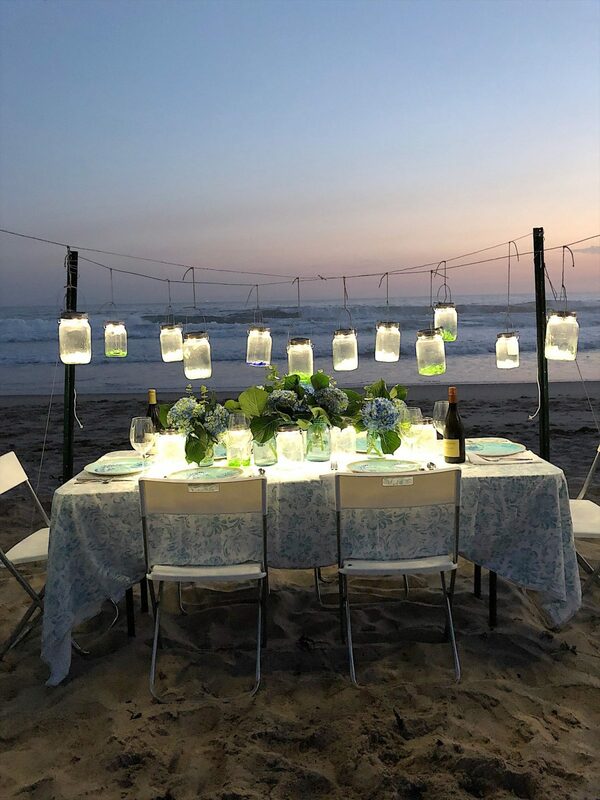 I was lucky to partner with Sonnenglas as they are the ones who make these amazing mason jar solar lanterns! They have a solar cell in the lid so all you do is charge the lid in the sun, and your lantern will light up for twelve hours! Is this just the most incredible setting you have ever seen? We had warm weather, no wind, and a gorgeous sunset. I bought some poles at the hardware store and pounded them into the ground. Then we used stakes and supports to keep the poles taught and strung wire diagonally across the top of the poles. I put my sea glass (that I have collected on the beach in front of our home) in the Sonnengals jars and then hung them from the wire. I probably could have served fast food and my family wouldn’t have cared. Our view was that good! But we had tri-tip and a fabulous gourmet meal. The setting was absolutely perfect for dinner on the beach. Absolutely magical??????????????? 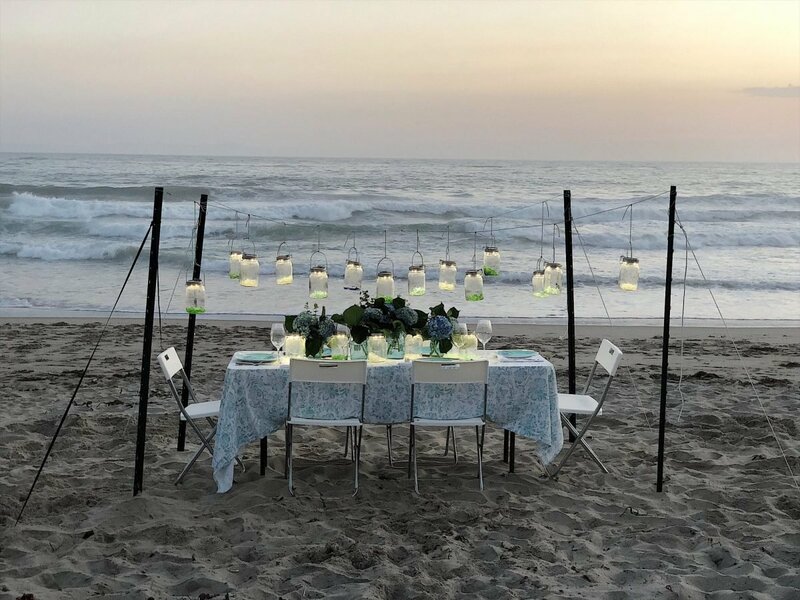 ?… have always dreamed of dinner on the beach set up just like this… WOW‼️???????????? I wAnted to do a dinner on the beach as well but I chickened out I was worried about bugs. Was that an issue? Your setup is stunning. 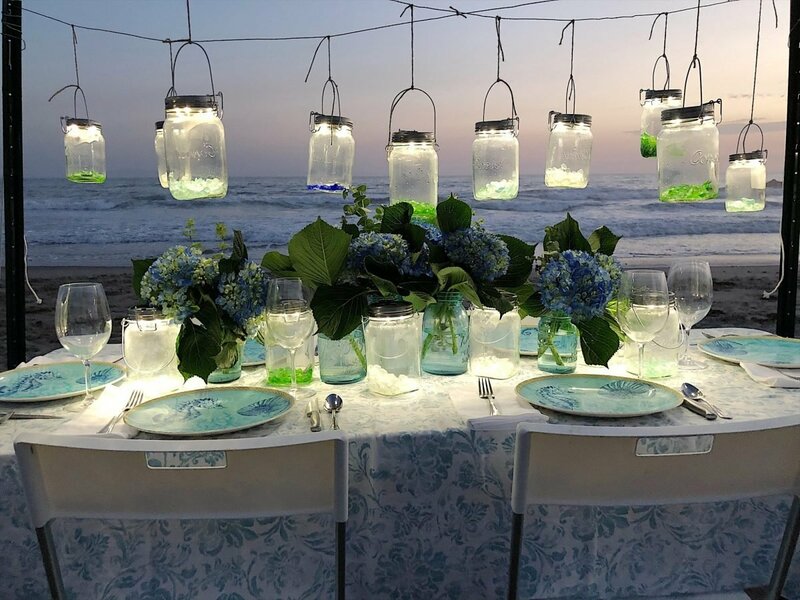 I love the effect of the lights with your lovely sea glass in the jars!!! Really pretty!!!! Lovely just Lovely ! Please send a link to buy the lanterns ! Fantastic Leslie! You know how much I love dinner on a beach. The lanterns are wonderful especially with the sea glass. Beautiful. Leslie this is stunning! 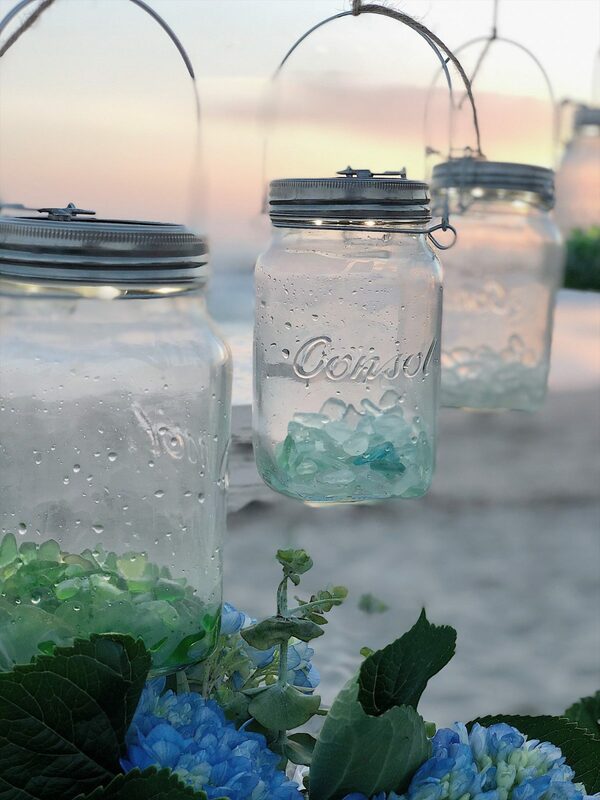 The sea glass in the jars is amazing!???????? I’ll be right over for dinner next weekend!???????? Did you create the awesome lanterns or purchase them? 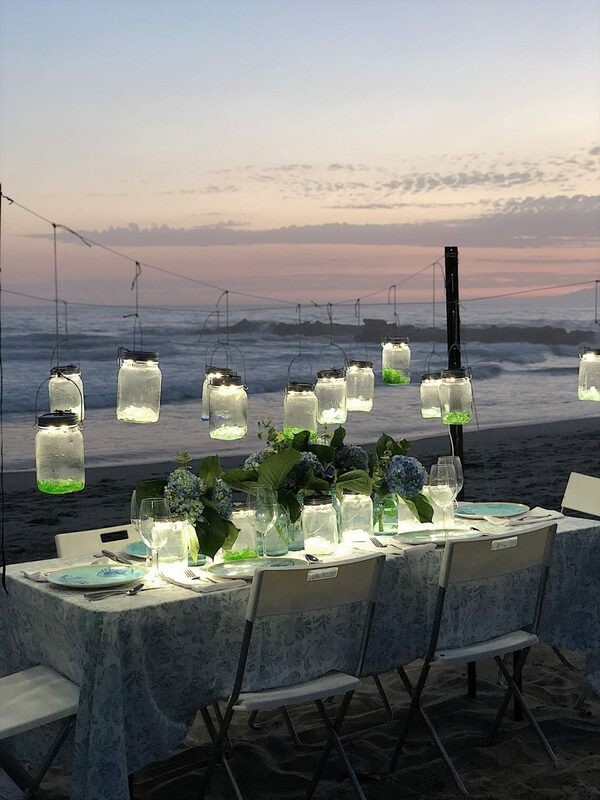 The illumination of your sea glass makes the perfect complement to your beachside dinner. I lived in Ventura for 10 years and had many a picnic lunch and dinner on the beach. I would move back there in a heartbeat – such a wonderful town and community. Just gorgeous you are so talented but I’m wondering, how did you get the beach to yourself? I would feel so self-conscious if there were people walking by gawking at me, but I guess that’s what wine is for right? 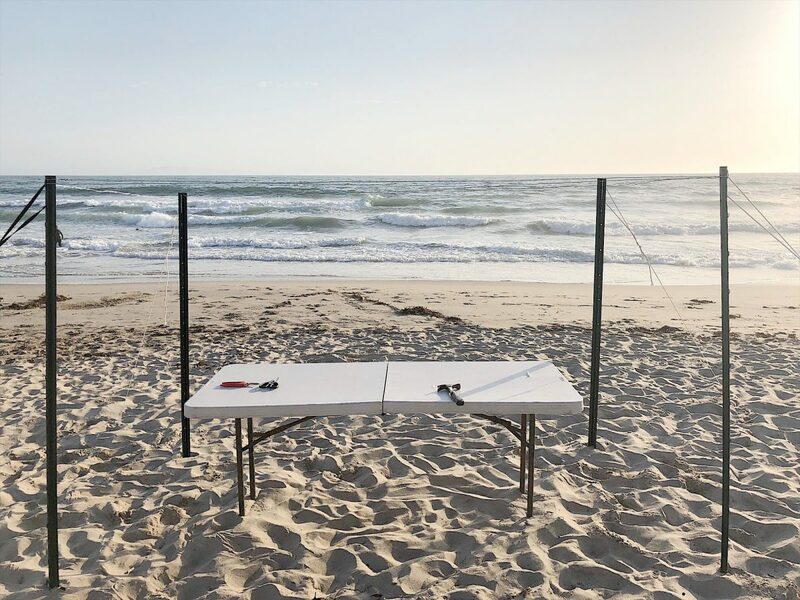 We have a beach house too but I’ve never gone to this trouble to make a table that looks so pretty!